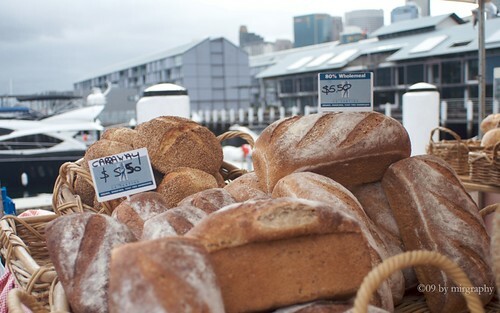 For the past goodness know how many years, I have managed to commit the cardinal sin of sleeping through the first Saturday of the month and not go to the Sydney Growers Market. In my defence, the market is open only between the indecent hours of 7 – 11 Am. So unless you are a food fanatic, an early bird or in my case still jet lagged, the chance of catching this market and still maximise your weekend sleep is rather slim. It just happened to be that Semi-Permanent was on the same weekend and when y asked if I would be interested in coming along, I half managed to get myself out of bed to catch the tail end of the market. 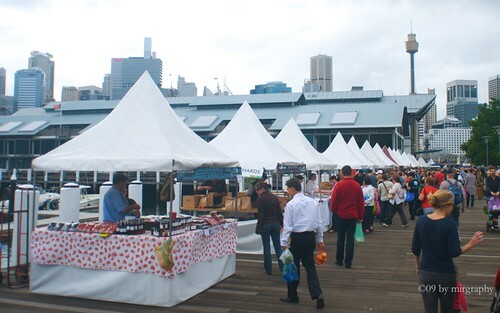 The weather was mild, families were out and in the grassy space between Pyrmont pier and Star City Casino a number of tents were set up to sell the most mouth watering produces found in Sydney. I gravitated towards coffee before milling around the many bakeries around the market. 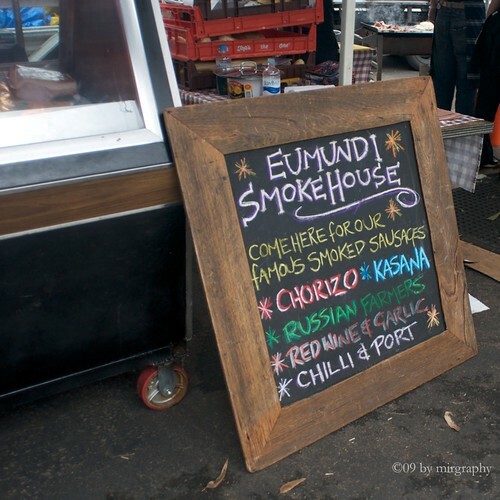 I managed to grab some sausages from the rather famous Eumundi Smokehouse before continuing on for the first session of Semi-Permanent. Helen from Grab Your Fork had been faithfully blogging about the Growers Market for quite some time know if you want to find out more, as for me I have pencilled in an early morning for the next market day. Some of the more memorable speakers for me in the past were: David Kinsey, Beci Orpin, James Jean and Marmalade to name a few. There were years that you wonder why on earth they bother with some speakers, but this year was a definite winner in my book. I only attended the Saturday session, half expecting to see the usual hit and miss line up as previous years, but was pleasantly surprised that all the speakers were quite amazing. 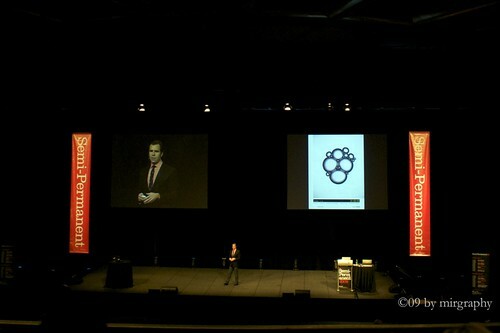 As for highlights… I was rather inspired by Wired’s magazine presentation. I haven’t picked up a hard copy in years and was not aware that the magazine went through a design evolution in the past few years. I loved the fact that every facet of the refreshed magazine was so carefully thought of from the newly created fonts, strong design and layout structure, but provided enough flexibility to use any visual element they like. Who else… Daniela Federici’s talk was gossipy and surprisingly candid in her experience with celebrities and Ron English (of the fat McDonald fame and that now famous image of Obama as Abraham Lincoln) was wonderful, it was rare to see works that you know will be an icon for many years to come. If you live in Auckland or Perth, SP is about to head your way later on in the year. I’m not sure if the line up will be the same, but it’s definitely worth checking. If that’s not possible, check out their podcast for videos of some past speakers. Interesting. Haven’t read Wired in ages either. Don’t think I’d know what it looks like now! I need to hunt an actual copy actually, glanced over a friend’s copy and thinking that subscribing is going to be on the agenda.